This has been an unusually wet spring, from the American mid-west to the eastern seaboard. Despite the large amount of rainfall, my wife and I scheduled a trip to Iowa to visit the 96-year old cousin of her late father. Her husband’s father, Earl Miller (1875-1964), had emigrated there from Somerset County, Pennsylvania, around the turn of the 20th century. My only wish while planing our trip was to stop at the Henry Ford Museum, Dearborn, and to see the tulips in Holland, Michigan, on the way past. Little did I know that the unceasing rain would play right into our hands and prove that mankind can and has overcome the worst that Mother Nature has to offer. Furthermore, many of the emigres who landed in these places sought freedom of religion and offered their talents to American enterprise in return. Susan and I started out from the mountains of west-central Pennsylvania on a Saturday morning. Avoiding toll roads whenever possible, we went the more scenic “back way” into Ohio. This was our first trip using the GPS (global positioning system) our son had given us for Christmas. It proved itself over and over again, not only saving us the searching and recording of “best” ways to “get there,” but probably also saving our lives several times as we competed with heavy traffic and heavy rain on the interstate. Our Garmin, whom we nick-named “Gabby” for her constant instructing, became a third person in the car. The other delightful surprise, upon exiting Pennsylvania, were the lower gas prices. I had paid $2.75 at home the week before, and Gabby gave us the choices of all tourist amenities, including discount gas at $2.29. Later in the trip we paid as little as $2.14. Such savings easily paid for some of our lunches. In fairness to our Commonwealth, that has the highest gas taxes in America, the lower gas prices in the mid-west may have meant worse roads, as was the case in Michigan. To make matters worse, the speed limit on the interstates was usually 70 MPH, and we heard on the local news that Michigan was considering raising that to 75 MPH on some stretches. That would mean that traffic would probably average 80 or more, despite road conditions, weather, and other dangerous detriments, such as talking on cell phones and texting. Not a good idea. I had used computer technology to book our rooms on the trip, and seemed to find the best bargains in locations close to our destinations. Unfortunately, the Red Roof we stayed in near The Henry Ford was being remodeled, but that was no excuse for the unvacuumed hallways and cloudy swimming pool. Susan was not happy. Our day at The Henry Ford more than made up for the poor hotel choice. Over the years I’ve had two personal reasons to be interested in the Ford brand: First, I proudly drive a Ranger pickup and Mercury Milan; second, my Great-uncle Russell Stanley Gray owned a Ford dealership in northern Allegheny County, PA, back in the 1920’s during a time of great progress in our country. The Henry Ford represents such a nation and her people in a sprawling complex of The Museum of American Innovation, complete with theater. The adjacent Greenfield Village and factory tour are optional. The first exhibit we saw included the Presidential limosines of John Kennedy and Ronald Regan. We learned that, because of the great cost of these conveyances, they had been repaired of bullet holes, cleaned of blood, and reused for years after their dreadful experiences. One might expect the hundreds of historical cars on display, but to actually be able to sit in the bus where Rosa Parks was arrested was stirring. There were airplanes and trains, early farm machinery and factory settings from America’s early industrial age, too much, really, to take in at one visit. We had lunch in an old diner right on the premises. We enjoyed an IMAX film on engineering and technology entitled, Dream Big. The funniest sight for me personally was a Ford Edsel. My mother had a crush on Henry’s only son so she blessed me with the middle name, Edsel. The billboard describing the monstrosity said that the car had been likened to “a Buick sucking on a lemon.” However embarassing for me, I will include this in my fond memories of The Henry Ford. All the way to suburban Detroit I thought of the many trips my late brother Carl had taken from Pittsburgh, hauling steel in his 18-wheeler. His ventures as a professional trucker included stops in Gary, IN, and Chicago, IL, also steel and manufacturing hubs. It’s ironic that his son married a girl from suburban Cleveland, and members of her family worked at the Ford plant there. I wondered why Henry Ford had established his auto making enterprise near Detroit, amid the Great Lakes. First, I was surprised to learn that young Henry was born on a family farm in Michigan. He had the reputation as a mechanical genius. At age 15, he could disassemble a watch and put it back together again. But he didn’t care for farming, so he traveled the short distance to Detroit to work as a mechanic. He eventually returned to the farm and became an expert in operating the various farm machinery. While there he attended business school for bookkeeping. Before long he was hired by the Westinghouse Company and later the Thomas Edison Illuminating Company. In 1893, at the age of thirty he was promoted to Chief Engineer. Edison and Ford were to become life-long friends. Edison backed him in his first manufacturing venture, the Detroit Automobile Company, which turned out to be unsuccessful. However, by 1901, Ford founded the Henry Ford Company and the rest, as they say, is history. By 1908, the famous and highly efficient Model T assembly line was introduced. The second reason Ford became synonymous with Detroit was its proximity to the shipping lanes on the Great Lakes and highways between the mills on land. Ford shared his success with his workers, more than doubling their wages and eventually giving them a 40-hour work week. It’s been said that Ford Motors attracted the finest engineers and mechanics in the country. Ford was known as a highly moral individual, and was often criticized for intruding in his workers’ lives. His biography says that, when he was still at home, he would walk four miles to church on Sunday. Now that’s devotion. But he was also patriotic, and with the start of World War I, Ford expanded his manufacturing to include aircraft and other vehicles of war. We believe that he exhibited the spirit of American ingenuity, and with his financial success was able to stay ahead of the technological curve, a quality which the company still exhibits today, right down to Ford’s routine and advanced use of robots. From Dearborn, the drive to Holland, Michigan, is a relatively quick trip west across the state. This time our hotel was a Days Inn, and as bright an experience as their sign promises. The innkeeper was from New Zealand and turned out to be a pleasant hint of the international city that is Holland. 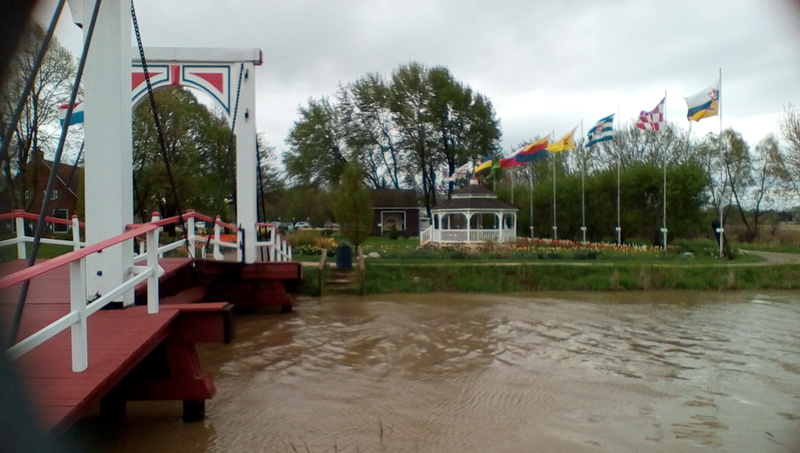 The Dutch weren’t afraid to settle this rejected and water-logged stretch along Lake Michigan in 1847 because they had been accustomed in the Old World to living on and working land that lay below sea level. Furthermore, they had developed technology to drain the water below the dikes, the windmill. For a modest admission fee, we were able to tour and climb a real working windmill, imported from The Netherlands in the 1960’s. “DeZwaan,” as she is called, meaning “graceful bird,” was built in 1761, and her blades are 80-feet high and 6-feet wide. 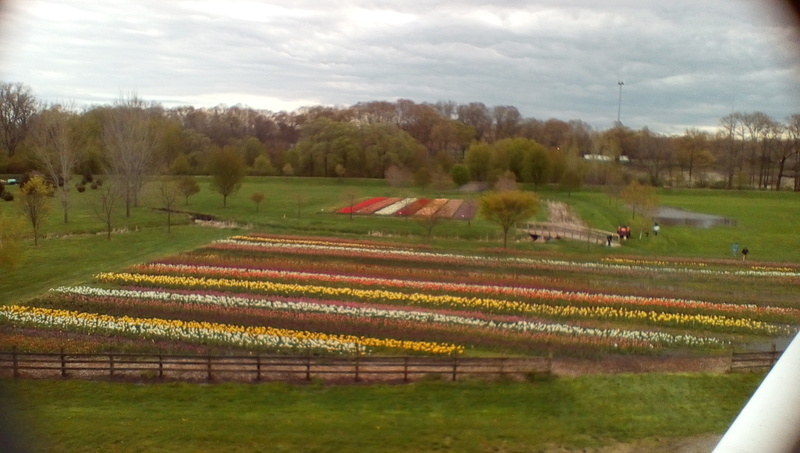 From the fourth level, about 70-feet above the park, we could look out over fields of hundreds of thousands of brightly colored tulips, beaming and ready to delight the throngs expected for their annual festival the next week. The old windmill combines technology with political correctness. Not only could the giant grist operation accomodate wagonloads of grain unloading their bags onto a pulley system that raised them to the top and instructions to the miller placed in a quaint wooden shoes by the farmers who had brought the grain, but in Holland, Michigan, the miller is a woman named Alisa Crawford, the only woman in America Dutch-certified to do such work. 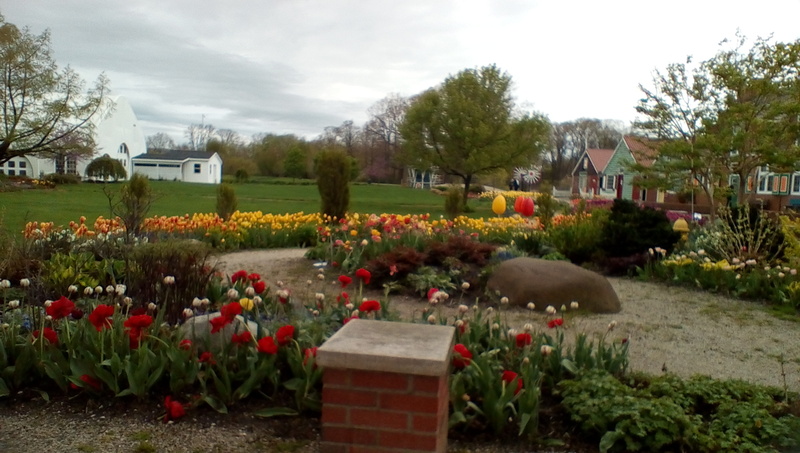 The town of Holland is also laden with tulips this time of year. Quaint and clean, Holland has many shops, restaurants, and reformed churches reminiscent of the Netherlands. Hope College sits right in the middle of town and seems to set the tone of the hope that this destination offered her first residents almost 200 years ago. Our final destination was a half day’s drive south along Lake Michigan and west across Indiana, Illinois, and the Mississippi to Iowa City. We also gained an hour as we entered Central Daylight Savings Time. Although we had been through Illinois several times before, we weren’t aware that the state had constructed a canal system, the most famous part is called the Hennepin from the Illinois River to the Mississippi at Rock Island. Often parallel to Interstate 80, it reminded me of our other canals in the East, the Erie , the Chesapeake and Ohio along the Potomac, and the Pennsylvania Canal and Allegheny Portage Railroad, which Susan and I had toured just the week before. Like the rest of America’s ingenius small waterways, the Hennepin had just opened in 1907 only to find that it couldn’t accomodate the large barges bound for the Mighty Mississippi from Lake Michigan. 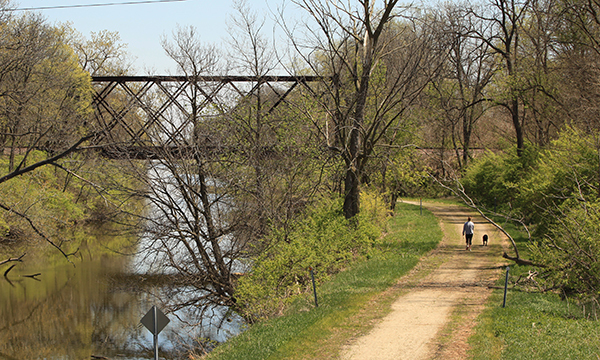 The railroads quickly filled the transportation void, and the Hennepin, complete with towpath for mules like the other canals in the East, was consigned to the National Registry of Historical places. Yet, how fitting for us in 2017 that we had just been reminded of the important place canals played over the centuries in the lives of the people of the Netherlands and Holland, Michigan. As we said at the outset, the spring of 2017 has left the midwest inundated with floodwaters. Some of the roads south of St. Louis, including the interstates, were closed for a time, but the farm fields to the north have been inaccesible for weeks. On either side of I-80, the tracts lie underwater, the bases of the trees submerged. One wonders where this excess will go, and more importantly when, with the water table so high this year. As with the oil and gas lines that criss-cross America, could water too be directed to the West and South in times of drought? The great irony for Susan and me on our 2017 spring vacation is that some of the vast farm fields now contain giant windmills, the European invention of hundreds of years ago, but these windmills are not for the purpose of moving water from the land or grinding grain as in Holland or lifting water from subterranean depths to farms and families as in the early American West . They are touted as the providers of “renewable energy,” generating electricity for the masses. If spring rain is the norm in the American midwest, so is wind, and what better place to put windmills than in the plentiful farmfields. Living in the mountains of Pennsylvania amid the tall, silver turbines, I had never thought how perfectly they might compliment the flat, wind-swept low plains of the American midwest. I’m told they not only provide green energy, but also generate extra income for the farmers willing to plow, plant, and reap around them. I knew that smart cars, trucks, and GPS units were now a reality on our roads, but I didn’t know that smart tractors now work many of the vast farm fields there. Farmers can now sit and monitor their machines as they do the monotonous work that it takes to feed America and the world. I said to my wife on more than one occasion that I’d like to have the concession of providing the seed, fertilizer, equipment, and silver grain silos so plentiful across the land through which we traveled. All of it requires a tremendous annual investment and faith that the weather will cooperate right through harvest. Isn’t it funny that we can control most of the parts of the farming process, but not the weather. Yet along side the GPS satellites that guide the tractors orbit the ones that suggest to the farmer when to plow, plant, and pick. This article might have been called, “From Dutch to Deutsch” because of our transition from Holland to Iowa. If the lower Michigan immigrants sought new opportunities to worship and work, so did the Germans of Ohio, Indiana, Illinois, and Iowa. They represented all four Protestant persuasions: Amish-Mennonite, Brethren, Lutheran, and Reformed. While the Millers we visited in Iowa, my wife’s father’s cousins, began as Lutherans in Pennsylvania, through marriage they moved to Evangelical United Brethren (EUB), now United Methodist. 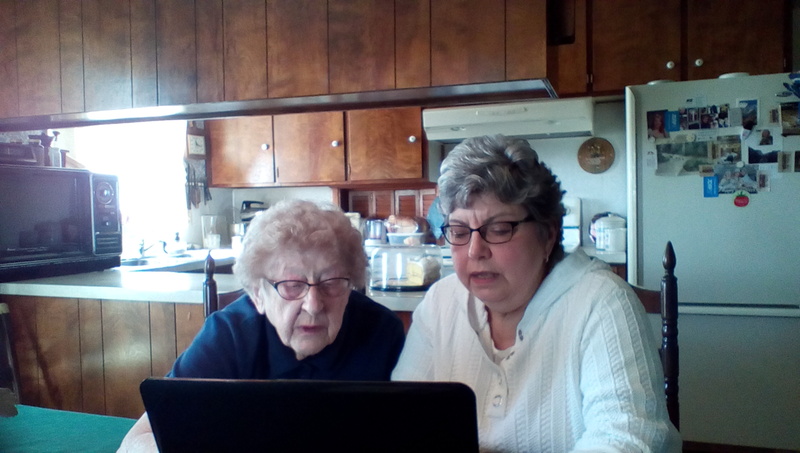 Susan’s maternal grandmother was Amish of southern Somerset County, and my interest in genealogy over the past few years has directed us into this community of believers as they moved from Berks and Lancaster Counties in eastern Pennsylvania to lands farther west. 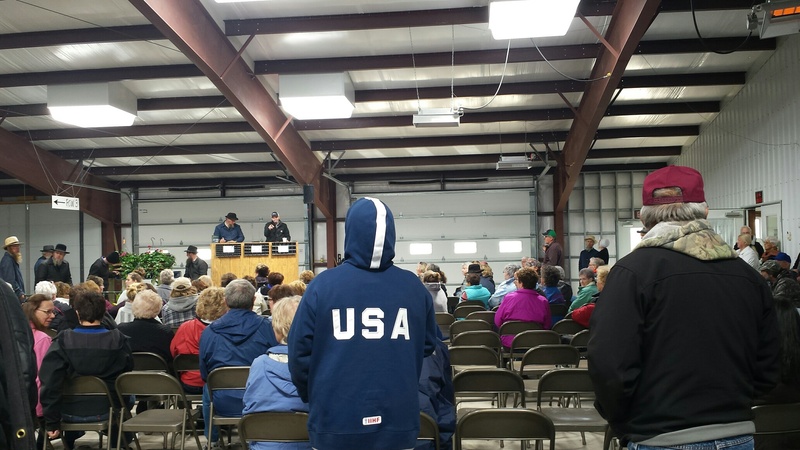 I had no idea, as we walked into the Amish spring flower auction held in Stringtown, Iowa, on our second day across the Mississippi, that those plain folk not only carried the surnames of Susan’s relatives and ancestors, but also personally knew some of them. It’s been said that it’s a small world, and the Brennemen, Bender, Hochsteddler, Miller, and Yoder families spread across America attest to that. Another of Susan’s midwestern cousins drives 100 miles several times a year to buy flowers at the auction for resale to benefit her favorite cause, juvenile diabetes. From Iowa City, where we stayed, Stringtown is a short drive and not far from Kolona. What was once mainly Amish-Mennonite is now multi-ethnic with Greeks and of course English. The small shops and restaurants are inviting, and to date the only “fast food” is a Subway. We fear that, like so many other villages in America, the identity of Kolona will change when they set up shop. For now, one has to smile to see the line-ups at the two red lights in town: car, truck, horse and buggy. Kolona is steadily developing an historic village tourist attraction, moving old buildings from the surrounding countryside, including a church, stores, farm units, and community properties to tell the story of the early settlers. But just down the interstate are the more famous Amana Colonies. A part of the German Pietist movement of the early 1700’s, the seven villages began near Buffalo, NY, but quickly outgrew that area. Unlike the Amish families, who left Europe when the governments there punished them for their pacifist lifestyles, the Pietists developed a more communal form of living, but like the Amish, had their faith and Church at the center of their lives. The members of the Amana commune voted in the early 1930s to disband, but most former members remained in the villages, and by 1934 the well-known Amana Appliance brand took shape. Again, this is a story of a people group, with strong moral convictions and a solid ethical foundation adapting to the changing American culture. 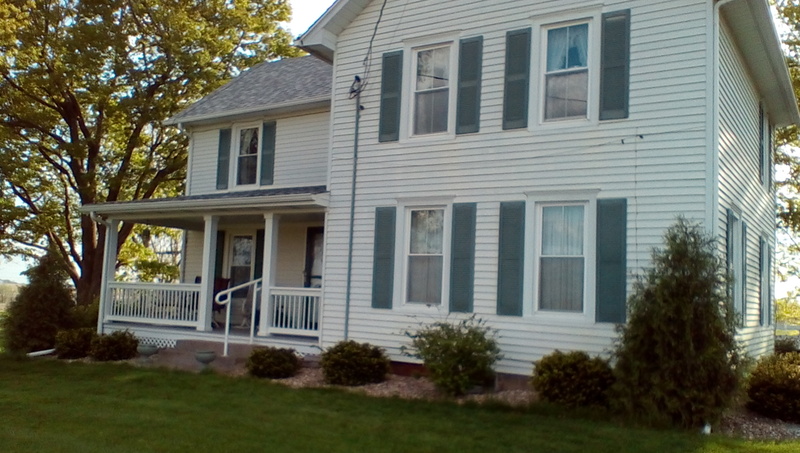 I became especially interested in the Amana Colonies because my Pearce family purchased much of the Harmony Societies’ land and businesses in Harmony, PA, before the American Civil War. Of note is what would become the Pearce Woolen Mills, sold to Woolrich in 1927. The Harmonites moved to Indiana and eventually back to the Pittsburgh area, what is now Old Economy Village, Ambridge, a National Historic site. Another ever changing communal living site is near Somerset County, the Bruderhof of Farmington . While in Iowa City, we were surprised to learn that this area, once called the Iowa Territory, was part of one of America’s great religious injustices called the Mormon Trek. In the winter of 1846, after the faithful were driven out of Illinois and other settlements in the East, they crossed the Mississippi and began a harrowing journey to the Great Salt Lake Basin in Utah. Iowa City and other towns in the West today are part of the National Park Services’ tribute to their sacrifice by identifying the roads and trails that they took. Just a note here that we had planned on swinging south to northwestern Missouri to pay our respects to some of my mother’s distant relatives who had left Pennsylvania after the Civil War to accept the government’s offer of cheap land and establish new homesteads. James Ross and wife Martha Anderson left Pittsburgh for Missouri to be with other members of his family around 1870, but James died unexpectedly in 1885, and is buried the Ft. Madison Cemetery, Kirksville. After this tragedy Martha chose to return to Western Pennsylvania and her family, however, we have not been able to find her place of burial. My mother’s grandfather Robert Patterson Gray, also of West Deer Township, Allegheny County, served with his brother Samuel Alexander and father William Sylvester Gray for the Northern cause, and when the war was over, the older brother Samuel married, moved west, and farmed land in both Missouri and South Dakota. We believe that Robert traveled to Missouri to consider homesteading there but returned to the family farm in Pennsylvania after his father died in 1879 to take care of his mother and continue the family business. Samuel and wife Margaret Gray, as is James Ross, are buried in Northwest Missouri. Their little town of Avalon is near the more famous Chillicothe. We hope one day to reconnect with the Grays out there. In conclusion, our recent vacation seemed to reveal several reoccuring themes in the settling of America: faith, family, community, industry, and technology. The Ford Motor Company relied on immigrants and those willing to move into an urban area where jobs were plentiful. The families of the Dutch Reformed, the Amish-Mennonites, the German Pietists, and even my Scots-Irish Presbyterians went where land was cheap and plentiful to provide a living for their growing families. The Amish now supplement their farming with the cottage industry of greenhouses, and the farmers of the midwest low plains expand their livelihoods through various technologies, from self-driving tractors to green energy windmills. Yes, faith was a prime mover among the Dutch Reformed, the Amish-Mennonites, and the Pietists, but today Dearborn, Michigan, is home to an expanding Muslim immigrant population. The hope of all Americans is that these latest settlers will assimilate into the culture, and that everyone can peacefully pursue what they believe is happiness. Our 2017 vacation took us both back in time and back to the future, from Michigan to Iowa. The week was memorable, to say the least, and a unique learning experience that we hope all who read this can one day share with their family.